Carola and I were asked by Horse Deals to provide an article on seedy toe. I posted my herbal support in an earlier blog, and now Carola has been kind enough to provide her equine bare foot care perspective. Carola and I have enjoyed a professional association for many years now, I am pleased to be able share her work with my readers. 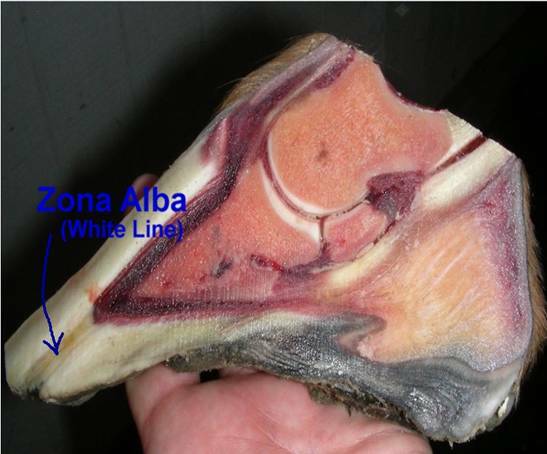 Another name (and probably a more appropriate, but interchangeable one) for the White Line of the horse’s hoof is the term “Zona Alba”, which in most healthy hooves is actually of a more yellow colour than white. The Zona Alba is particularly vulnerable to damage as it is part of the primary weight bearing structure of the wall and therefore, if the hoof is bare, in contact with the ground all of the time. 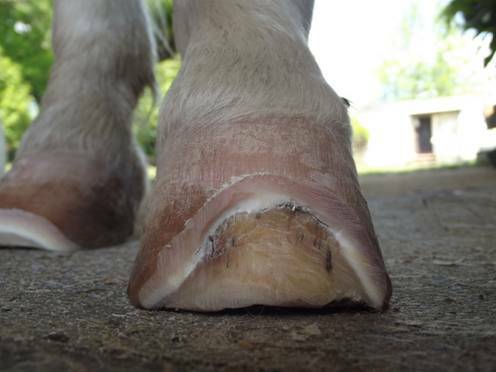 Damage to the Zona Alba (White Line Disease or “WLD”) can sometimes be confused with a seasonal, nutrition related separation of outer and inner hoof-wall, which we will be not discussing in this article as its appearance will usually resolve within a few trim cycles. The phenomenon may appear at the end of a wet season or early spring when the hoof-wall that was produced about eight to nine months earlier (end of summer, early autumn) arrives at the ground and undergoes conflict stresses: The wall-fault may be the result of a short term nutritional imbalance or deficiency while it was produced. 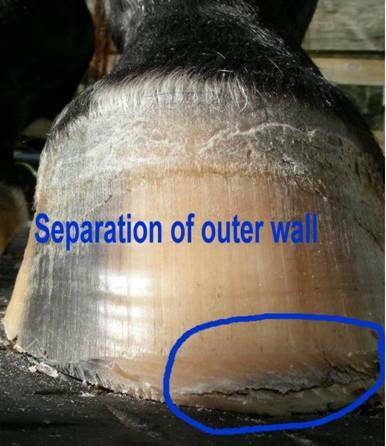 Damage to the White Line and “WLD”, however, can be caused by a number of reasons and often remains undetected until large areas of hoof-wall break off, cracks appear, and the horse presents with lameness. If large areas of hoof-wall are compromised, “WLD” can even lead to loss of suspension attachment of the pedal bone, leading to rotation. Damage to the Zona Alba or White Line always needs attention. Early detection means that corrections can still be made easily – so make sure you are looking closely at your horse’s hooves while you pick them up to clean them, as this can save you and your horse a lot of trouble. Cleaning the hoof daily with a hoof-pick is often not enough as you may overlook small stones embedded in the white line, dirt pockets (“gravel”), small cracks and decomposing horn material. 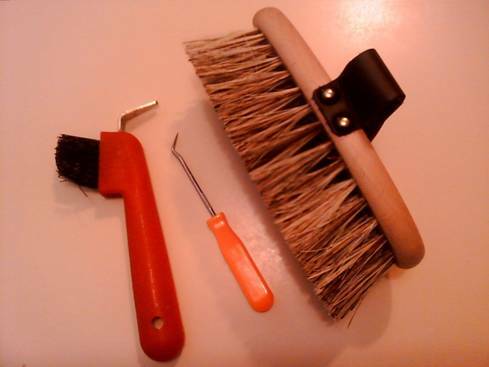 Besides a common hoof-pick, you need a hard bristle brush and a smaller metal probe to inspect the white line. Make sure your horse is receiving good and regular hoofcare, as correct internal and external balance and function is as important as the horse’s “macro management”. “Maco management” includes the daily care that you are providing, such as good nutrition, species-appropriate lifestyle and environment, which includes hydration of the hoof horn and adequate exercise and movement. Regular hoofcare – and the individual “micro-management” of your horse’s hooves by a competent hoofcare professional are essential, as the dynamics on the hoof capsule itself play an important role to the health of the various components of the hoof. 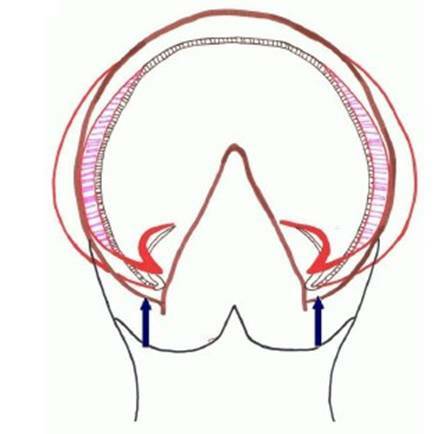 The white line, for example, can stretch and deform from internal and/or external imbalances or pathologies, it can stress from unnatural and unphysiological impact concussion (see sketch), it can bulge from overstimulation, and it can abrade excessively due to unfavourable terrain (deep sand or gravel). A typical scenario during the dry season would be caused by the dehydration of hoof-horn. 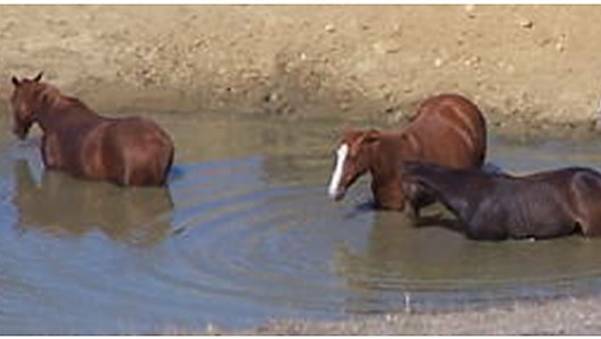 Not many domestic horses drink from dams, lakes or rivers where hooves are exposed to water or mud during water intake while an incidental rehydration of the hoof horn takes place. The healthy horn material of the Zona Alba is relatively high in water content, and therefore softer than wall- and solar horn. 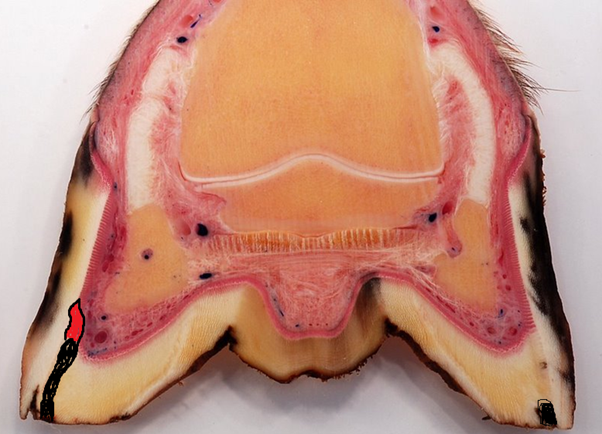 When the hoof dehydrates, due to prolonged exposure to unnaturally dry terrain, it contracts progressively to deeper levels, while the white line horn will shrivel and become crumbly. This will obliterate its natural connecting seal and will leave it vulnerable to wear and abrasion. Where once was healthy White Line horn, will now be a groove between the actual wall and the sole of the hoof and gaps will open in between the leaf-like horn formations. Note that stable bedding (and retained ammonium within it), can dry out and destroy keratin, just as the placing of a hot shoe will singe and dehydrate the horn rapidly. Too much water on the other hand and contrary to common belief, is not a problem. However, soft, muddy ground over a long period of time is, as it causes a lack of stimulation and therefore compromises healthy horn production. If decomposition is faster than horn production, we will have a problem! Decomposition always involves opportunistic micro-organisms that are found everywhere in the ground. They can be aerobic and un-aerobic. They can be various bacteria and various fungi. The existing “gaps” and abraded grooves will allow the invasion of the always present micro-organisms. They exist in the dirt that will be embedded in the void with every step and therefore this can become the beginning of what we call “White Line Disease” (WLD). 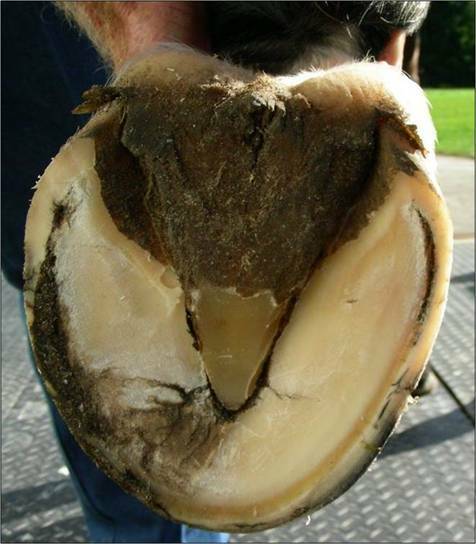 Once the integrity or the hoof-capsule is lost, localized weakness can lead to cracks in the hoof-wall itself and allow for further trauma. Once the pathogens have reached living tissue, the body will react with an inflammation process, which releases alkaline cell secretions. Pathogens will thrive in this nourishing environment and cause even more damage. If not attended to, this damage can lead to “de-lamination” – a serious process – and with similar consequences as “founder” (breakdown of lamellar attachment, as mentioned earlier). As with everything: Prevention is better than treatment. As mentioned above, early detection is important. Don’t ignore “grooves”, cracks (even small ones), small embedded stones, nail holes, stretched White Line, black spots or dirt in between the leaf-like horn formations or otherwise compromised White Line horn. You don’t want it to become something sinister! So, what to do to prevent trouble in the “zone”? What to do if there is already trouble in the “zone”? For the treatment of minor lesions as well as the rehabilitation of serious seedy toe infections and fractures in the hoof-wall (cracks), follow your hoofcarer’s instructions. He or she can only prevent damage or facilitate hoof regeneration to fully functional health if YOU get actively involved. After all, you see your horse more often then he or she does – hopefully! Any breach to the integrity of the hoofcapsule must involve treatment and protection of damaged areas. 2) According to your hoofcare provider’s instructions and his or her recommended remedy, re-dress the lesion as frequently as instructed until it has grown out. This may take a few weeks or many months, depending on the severity of the damage and if or not a resection of hoof-wall was performed. Your involvement may include manual removal of the old dressing, cleaning the cavity, bathing, soaking in- or spraying the entire foot with anti-microbial solution and re-dressing the problem area in order to treat and protect. Personally I prefer apple-cider vinegar soaks, mild antifungal/antibacterial solutions such as Canesten or Listerine, cotton-wool dressings saturated with antifungal/antibacterial cream, or (if dry environment) tea-tree oil, healing clay or bees-wax. Very rarely do I use chlorine solutions or copper sulphate (blue stone), as it invades healthy horn and irritates living tissue. It is also important to avoid anything that may entrap pathogens – remember that you can not sterilize a hoof!